All those involved need to grasp the concepts behind the Waste Management Hierarchy, because it is the essential concept which will always drive sustainable biogas development and the whole so-called circular economy. In the forefront of anyone’s mind when developing a sustainable waste management strategy for a business or a project, should be the inverted pyramid of the waste hierarchy diagram. Keep reading if you don’t yet know about this concept, and if you do, also read-on. We say that because ideas move on and there are new developments. Applying the waste management hierarchy very often points waste managers toward the use of the anaerobic digestion process, and by doing that it has done much to promote the current high level of development activity in the biogas industry. 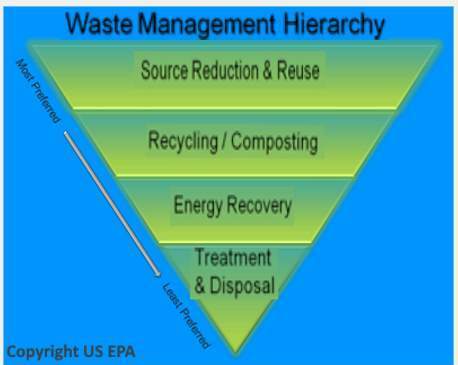 An enhanced version of the waste hierarchy diagram. The three chasing arrows of the international recycling logo. It is sometimes accompanied by the text “reduce, reuse and recycle”. Source reduction, also known as waste prevention, means reducing waste at the source, and is the most environmentally preferred strategy. It can take many different forms, including reusing or donating items, buying in bulk, reducing packaging, redesigning products, and reducing toxicity. Source reduction also is important in manufacturing. Lightweighting of packaging, reuse, and remanufacturing are all becoming more popular business trends. Avoid is the ultimate zero waste challenge; the highest point on the hierarchy. The volume and rate at which resources are being channelled through the human economy needs to be slowed, along with a recognition that all our material goods have an energy ‘price tag’. To effectively address the zero waste and climate change agenda, there needs to be a move beyond recycling into the largely uncharted territory of the higher end of the hierarchy, to reuse, reduce and avoid, with a particular emphasis on eco-efficiency (the same or greater utility from less material input). The waste management hierarchy is one of the guiding principles of the Zero Waste SA Act 2004, and is regarded in South Australia’s Waste Strategy 2015 – 2020 as a key element for guiding waste management practices in South Australia, while still recognising the need for flexibility based on local and regional economic, social and environmental conditions. Waste management can be briefly defined as the process, in which the different kinds of wastes are being collected, processed and recycled in order to convert them into useful materials or to dispose them in an environment friendly way. The different types of wastes include the solid waste, liquid waste, gaseous waste and the electronic wastes etc. The waste management hierarchy is a concept regarding the waste management and its acts as a base for developing the various waste management strategies. The sole purpose of drafting the hierarchy is to generate the maximum amount of beneficial products from the available wastes. via Hierarchy Structure. Recycling involves the collection, sorting, and processing of products into raw materials that can be used as inputs for the production of new products. For its part, the recycling of products generally results in a material that is more energy-efficient, less polluting and more cost effective to produce, while avoiding the consumption of virgin materials. Take, for example, the case of aluminum. Over 61 billion aluminum cans were recycled and reused in the US in 2011, representing a 65 percent recovery rate. In the process of being recovered, the use of 17 million barrels of gasoline was avoided, in that less energy is required to process recycled material than virgin content. business/public body prevent any of this waste? Avoiding waste saves money. reduce food waste. See http://wastehierarchy.wrap.org.uk if your business or public body designs, manufactures or distributes goods, could you use less input material and/or less hazardous material in design and manufacture? Could your surplus materials be someone else’s resource? Are you using the right amount of packaging for shipping? Could you design products to last longer or be repaired more easily? Are your products subject to legal eco-design requirements, and do they comply? See http://wastehierarchy.wrap.org.uk sell/donate/swap unwanted items (textiles, furniture, electrical and electronic equipment, toys or leisure equipment etc) retain and use electrical and electronic equipment, textiles or furniture for longer. Could you refurbish or repair them, instead of buying new ones for hire or lease, rather than purchase electrical and electronic equipment, textiles or furniture? Buy or re-use second-hand and vintage items. See http://wastehierarchy.wrap.org.uk maximise the life of tyres through transport and logistics practices. Tyres can be re-used if they are still in good enough condition. For example, tyres which still have enough tread can be re-fitted on vehicles if they have been inspected and marked appropriately. Re-use carrier bags, refill water containers from the tap rather than buy bottled water, and use durable rather than disposable cutlery and containers. Hi. The waste hierarchy is one way to be green, but here is another tip. For your daily commute, find a group with whom to carpool. Getting those extra cars off the road will save on gas and pollution. As well, carpooling is very economical for you! Just taking one day a week from your traditional driving can mean up to a full tank of gas saved each month, depending on the length of your commute. Great Post ! Thank You very Much writing such a informative post which gave me right information about waste management. Greetings! I found some very helpful information in this particular article! I wish we were as well organised as you are in Europe with your Waste management hierarchy.